Satan is diabolical in his schemes to warp the plans of God. Let us never lose sight of what our role is here on earth as followers of Jesus Christ. It is not to bring revival to a secular nation. It is not to fight for that which is already passing away. It is not to prepare the earth for the second coming of Christ. Our purpose is the Gospel. It is to share the truth of Jesus Christ to a dying world that desperately needs Him. They need Him as a Savior. They need Him as Lord in their lives. They need Him because He is the only way to escape the coming wrath of God. When Jesus looked out on the multitudes He had compassion for they were like sheep without a shepherd. When Christians look out on the multitudes today it is only to stretch forth an accusing finger in blame and utter contempt. I know these are subjects that are simply not preached anymore because someone using the carnal wisdom of man has decided they are not "seeker friendly." Now, many professing Christians may read this and think that it is an obvious truth but drilling down into the behavior of Christians in this country reveals the opposite is going on. There are Christian leaders today who make their livelihood on the active victimization of Christianity. Today's exhibit is the release of the latest faux-Christian movie, God's Not Dead 2, Electric Boogaloo. It is all the rage in Christian circles. They even prepared "church kits" so lazy pastors who do not seek the Holy Spirit for their sermons, can "preach" the movie. The premise of this movie is the same as the first installment. That the big bad secular world spends its days victimizing Christians in this country. That there are good guys, who are always the Christians and bad guys who are always trying to persecute them. It creates a decidedly obvious line between us and them. That we have to constantly push back and be willing to "fight for our faith"; lest somehow we be overtaken by the godless. Not only is the premise absurd on a factual level but it is even worse biblically. There is no call from Christ to hate the very people we are supposed to bring the Gospel to. Yet that is what movies such as this and the victimization pushers that traffic in it create. Intended or not is irrelevant. It seems we have forgotten our key verse from the Sermon on the Mount. Too often we are sold on the notion that loving one another implicitly means only those in the pews with us each Sunday. Those wretched sinners in the world? They are the cause of all the problems in the world and if they would only start behaving better than America can be revived. Unfortunately that is a pile of unbiblical nonsense. The second false teaching is basically a more detailed version of dominionism and that is the "seven mountains" theology. This is embraced by all of the heretics from the New Apostolic Reformation, IHOP, the Kansas City Prophets, Bill Johnson and Bethel Church, and countless others. In this theology, they actually identify seven cultural mountains that must be conquered by Christians to bring the end times about. One area is government for example and another entertainment. This is why you see so many churches backing politicians and pushing Christo-movies, such as God's Not Dead 2. It is all fool's gold however as these movies and politicians only seek to divide us further from the lost. Do not underestimate the result of movies such as these beloved. They push people further away from Christians and thus Christ. It pushes the unbelievers back because they see the way these movies portray them and how they portray Christians. They see that this does not line up with reality. It further cements their view of Christians as liars and hypocrites. It also pushes Christians away from the lost. How could it not? 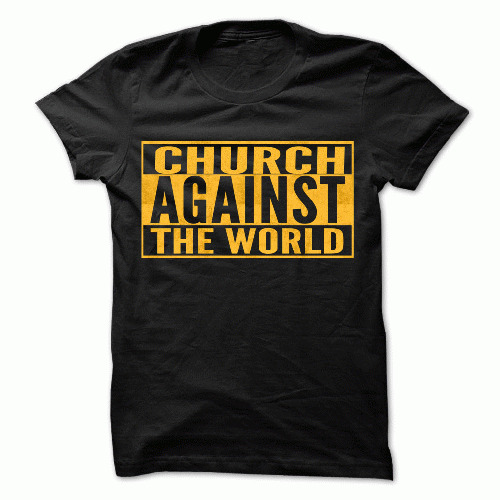 It teaches that those outside the church are the enemy causing persecution against them. The third false teaching is more of the background for the first two. This is the idolization of America. While there are many who do not even realize they support such a perspective, the common pushers of this today are people like John Hagee, Franklin Graham, Anne-Graham-Lotz, Jennifer LeClaire and countless others. Let me say up front that while this country is certainly the greatest experiment in secular history it is not under covenant with God. It has never been under covenant with God. The vast majority of the founding fathers were deists, which means while they believed in "a" god, they did not believe in "the" God. Some were actually atheists. You have to understand beloved when you hear about movies like God's Not Dead 2 and national prayer marches for revival, it is all about valuing the wrong life. We are supposed to be pilgrims and sojourners through this land and this life. Instead we like living in Sodom. We like its excesses and sin. We enjoy playing church like we are heaven bound while flirting with the world and living like hell. We are supposed to be like a shining city on a hill. A peculiar people. The world is supposed to look at the church and want what we have. Instead they look at the church and see an entity that is striving to be more like them. Sure it may have a "Jesus veneer" on but they are not stupid. When churches refuse to look like churches, act like churches, and behave like churches they know what is going on. When the first half of service is a rock concert with club lighting and smoke machines followed by a hipster relevant sermon about how great they are no wonder they are so willing to be "churched." A cafe lounge, free coffee and Wi-Fi, and they validate parking? More importantly, they validate my sinful lifestyle and rebrand it as "poor choices." Sign me up! The money they are willing to pay is more of a cover charge than an offering anyway. A fair price at their discretion for entertainment services rendered. Beloved, what isn't wrong with this statement? First of all, sin is not "things we're doing wrong." It is an affront to the very God who created us. Secondly, people do not know. Not without the Holy Spirit drawing them and convicting them. Thirdly, look how pitifully Joel Osteen views the Gospel of Jesus Christ! He considers it beating people down and talking down to them! Yet 50,000 per week go to Lakewood and millions more watch him on television and read his books. Every year over 75 million dollars is brought in from donations. You think that is the blessing of God? No beloved. That is the judgment of God. And it is not just Joel Osteen beloved. It is all the prosperity pimps selling God as if He were a whore. It is the word faith heretics like Meyer and Dollar who try and say that we are gods. It is the aforementioned Bill Johnson, NAR and IHOP. Corrupting the Gospel with eastern mysticism, false signs and lying wonders and the utter carnality of this world. It is TBN, the Word channel, seven steps to a better you, destined to reign, holy laughter, glory clouds, gem stones, gold dust, angel feathers, cross-less churches, bloodless pulpits, and a gospel without the realities of Jesus Christ. Do you think any of this, while mostly successful by the world's standards, is remotely blessed by God? No. It is the judgment of God upon His faithless church and it is well underway. I say these things while there is still time to come out from among them. There is still time to not despise the very people who need Him the most. We are carriers of the keys to the kingdom yet we shut the door in the faces of those who are trying to come in. God is not dead. He is merely portrayed that way by those who claim to love Him. How many times have you heard that "God is not allowed in our schools anymore." Do you realize the nonsense of that statement? Is God hanging out in the parking lot wishing He would be allowed in again? He is inside the schools in every single believing child and teacher. We ought to spend more time trying to live according to the Ten Commandments than protesting if they are not in the front of the courthouse. The Bible says we ought to not be ignorant of the schemes of the devil and this is a huge scheme. To take the people who are the chosen vehicle to deliver the Gospel to the lost and turn them against the very same people they are supposed to minister to. Someone is being forced to bake a cake? Oh the persecution! A county clerk is being forced to sign her name to marriage licenses as part of her job! Hurry and organize the protests! You can't tell us God is dead! Except the world never said that. It just said if you sell cakes for a living you cannot choose who you will and will not service. It said if your job is to sign something then you ought to sign it. It is not your Christian duty or service to degrade someone in the world because of their sin. That is not preaching the Gospel. That is not showing the love of Jesus. It is arrogant and stupid. These are lessons that are not lost on those seeking. The number one reason given by people for not going to church is that Christians are hypocrites. In response, do we try and make sure we live a life of honesty as instructed to in the Bible? No. Do we try to curb our behaviors that lead people to this conclusion? No. Instead we make movies like God's Not Dead 2 which exalts Christians instead of Christ and gives the distinct impression that everyone else can go to hell.